The New York City Department of Corrections Disaster Relief Association was created to enhance the lives of those in need through community service, crisis intervention, and awareness. We are comprised of uniformed and non-uniformed personnel volunteering to bring relief to those in crisis. It is our belief that no one should be alone in the event of a catastrophe. With this goal, we use physical labor, donations, emergency supplies, clean-ups, and fundraising in addition to various other methods to complete each project. Our primary goal is to help our neighbors, both local and abroad, in their time of difficulty. If you want a personal injury lawyer please click on our link. The leaders and volunteers of our association try to abide by our motto, “Each day we are alive is a chance that we have to make a difference in someone else’s life.” Our association makes it a point to help others when they are at their most vulnerable state during active disasters and immediate aftermaths. Most importantly, we hope to become the bright light in disaster victims’ darkest hours. NYCDOC Disaster Relief Association In the News! 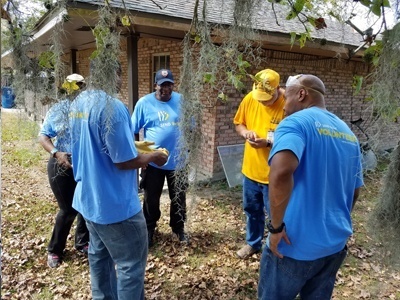 Hurricane Matthew Clean-Up in Gonzalez, Louisiana, 2016. We invite you to join our relief operations and also be of service to others. As a member of our disaster relief association, you will be sent on various missions throughout the U.S.A. and other disaster-afflicted countries such as Haiti. Our team is excited to welcome you to our team of volunteers.